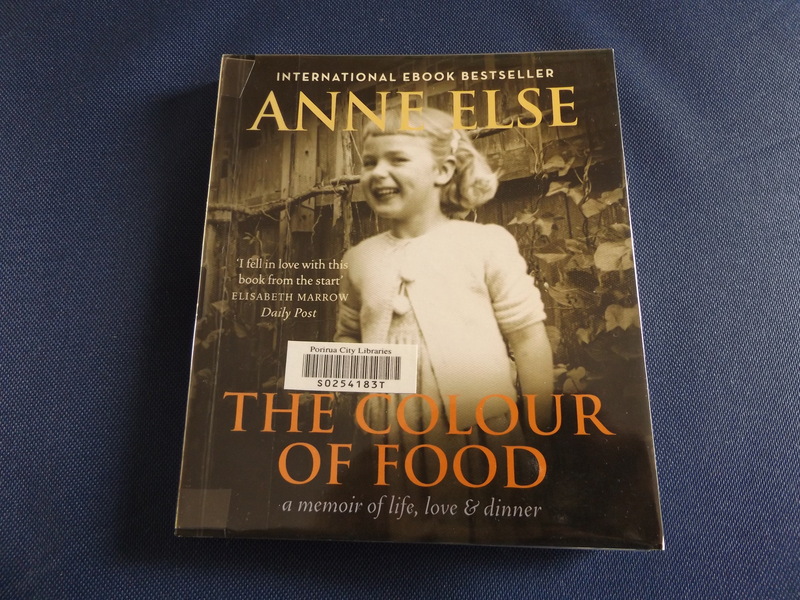 “The Colour of Food” by Anne Else is one of the most enjoyable books I have read in 2014. Its popularity was indicated by the wait I had until the local Library copy became available to me. I see on the cover of this easy to hold book, that it is already an International EBook bestseller. I love adopting a comfy reading position, holding a book, turning the pages and referring back and forth amongst the contents with ease and at a pace that suits me. At times the experiences she describes around love are very intimate and evoke emotions across the spectrum. There were many times as I was reading when I would pause and reflect on my own life and experiences, as signposts in her words touched me or pointed me back to a link in my past. I follow Anne’s personal blog and her life without her beloved Harvey so some parts of this book already felt familiar. I also have Harvey McQueen’s “This piece of earth” on my bookshelf which meant I already knew of their special love and companionship and some of their enjoyment of food and cooking together. This familiarity certainly enriched my reading of this memoir. So much social history is detailed in this book and when I look at my late mother’s recipe books which contain many of her mother’s recipes it is obvious that food provides a rich feast of detail on how we live our lives and how life changes. From my own experience I can well remember the advent of Kai Si Ming ( really mince with a stack of sliced cabbage and a packet of chicken noodle soup stirred through it, but a new idea in Mum’s kitchen) and Coleslaw! Cabbage had always been cooked to a very unappetising gooey mass before shredded raw cabbage came into vogue. So reading this book was a treat, in a way food should be, and it was a surprise when I turned the final page to find the memoir’s end. As all good books do, it left me with questions unanswered and plenty to reflect on especially around what constitutes “women’s work” and our need to be creative, while also using our education, training and skills. I’ve spent time since finishing the memoir considering the many and varied aspects that food and the preparation and serving of it play in our social, emotional and psychological lives. And like a very good meal this book left me wanting more. For good measure Anne includes 24 recipes to sample, ranging from very simple to exotic, but with her guiding hand all very achievable. And to tempt readers further she has included two lists of books which have inspired her. These include Memoirs and Recipe books. I’ve already jotted down her “Fresh Courgette Salad” recipe as I watch the first small courgettes ripen on my plant. Yum! This entry was posted in Uncategorized and tagged "The Colour of Food" by Anne Else, "The Colour of Food. A memoir of life, Anne Else, Books, cooking, cuisine, enjoyable books, food, love and dinner" by Anne Else, memoir, memoirs, New Zealand Women authors, NZ life, reading, recipes on December 18, 2014 by ordinarygood.